Ultimately, the work on climate change is done on the ground and is up to each of us. That is why America’s Pledge on climate is so important, as former U.S. President Barack Obama told city leaders in Chicago last week at the inaugural Global Covenant of Mayors North American Climate Summit. Policymakers from around the world met at the conference to look for ways to do more to tackle climate change, a drive we’re also seeing from states and businesses. At a time when the Trump administration is abdicating the U.S. position as a climate leader, a growing number of U.S. states, cities and businesses are stepping up to take strong climate action. States can boost renewable energy by setting tougher renewable portfolio standards that require utilities to generate an increasing share of their power from solar, wind and other renewable sources. New York and California have already done so. Utility customers – including cities, businesses and other consumers – can go beyond what’s required by participating in the voluntary clean power market. This market accounts for more than a quarter of all renewable energy sales in the United States. States can encourage cities and businesses to buy more renewable power by investing in grid infrastructure to benefit wind and solar producers. In states with Community Choice Aggregation, which allows individual customers to pool their purchasing power, cities can choose to buy clean energy for entire communities. Big energy buyers such as large tech companies and universities can also send strong market signals to utilities by investing in clean energy to power their operations. There’s plenty of room for growth in this area, since voluntary purchases – those made beyond what regulations require – still only represent about 3 percent of total annual electric utility sales. 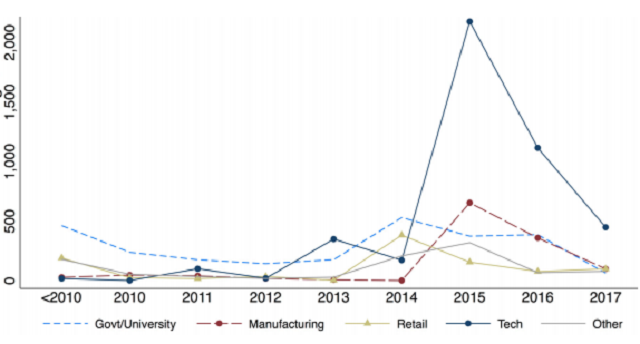 The tech industry has led the PPA market (with the largest purchases coming from Google, Amazon, and Apple), with a spike occurring in 2015 amid uncertainty over federal tax incentives for renewables. (Source: NREL 2017). While building energy codes have improved the efficiency of new and modified buildings, there’s potential to do more. For new buildings, stronger codes to foster energy efficiency need to be put in place, implemented quickly – most states now rely on less rigorous, outdated codes – and effectively enforced. Existing buildings need to be brought into the mix, with building energy codes tailored to them. 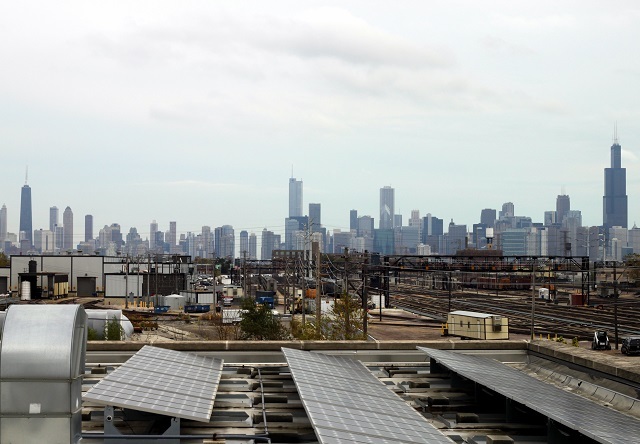 Taking the lead, New York City recently announced a plan to reduce emissions of its existing buildings by 7 percent by 2035 through mandated energy standards. Private sector innovation and a movement toward zero-emission vehicles could shift the growing transport sector away from fossil fuels, and auto-makers are already on board. States can help accelerate this trend through stronger mandates for zero-emission vehicles and support for development of next generation technologies and recharging and hydrogen refueling stations. Policies now on the books in eight states could put an estimated 3.3 million zero-emission vehicles on the road in 2025. If all 50 states followed these policies, there could be more than four times that many. To help cut down on methane emissions, which contribute approximately 10 percent of total U.S. greenhouse gas (GHG) emissions, states could offer financial incentives to encourage methane capture from landfills and dairy and hog farms to produce renewable natural gas through landfill gas projects and biogas recovery systems. In addition, states could encourage research and development to find better ways to curb livestock emissions. To ease repair of methane leaks from natural gas pipelines, cities are starting to use data gleaned by Google Street View Cars fitted with special air quality sensors that show where the leaks are. Public-private collaboration lets gas utilities identify and prioritize the leakiest sections of their infrastructure, with benefits for customers and the environment. 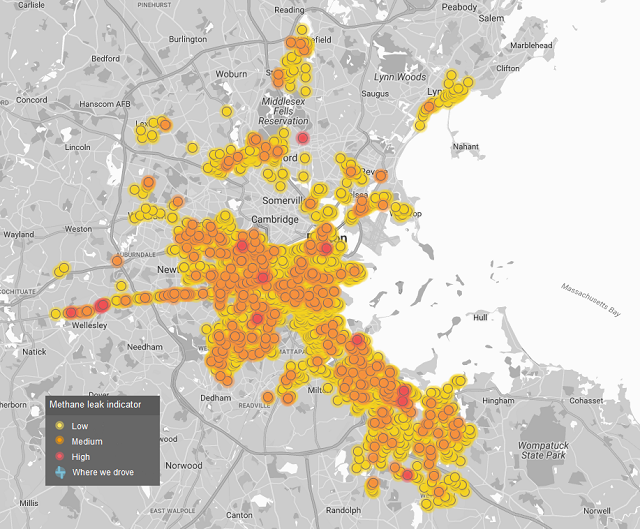 Example output of a methane-sensing technology for the City of Boston created by the Environmental Defense Fund, Google, and Colorado State University (Source: Environmental Defense Fund). Boost efficiency and distributed generation for manufacturers through financing, regulation and other support to enable U.S. industries that rely mostly on fossil fuels to upgrade facilities with more efficient equipment, renewable energy and lower-carbon energy. Cut back on hydrofluorocarbon use and emissions by banning sales of refrigerants, foams and aerosols that contain these climate-warming chemicals, using less harmful alternatives where available and encouraging development of alternative technologies. Expand carbon pricing networksby adopting policies in individual states or joining existing markets such as California’s or RGGI’s, as Virginia has recently proposed. Existing carbon markets can expand to cover emissions from more sectors, and private companies can adopt internal carbon pricing to manage climate risk. States, cities and businesses are already tackling GHG emissions and the opportunities listed above show that non-federal actors can go even farther. Over the next year, America’s Pledge will build on these opportunities by analyzing the greenhouse gas emissions reduction potential from both existing and more ambitious non-federal actions. Kristin Igusky is an Associate with WRI’s Global Climate Program. Karen Chen is an America’s Pledge Intern with WRI’s Climate Program. Tom Cyrs is an America’s Pledge Intern with WRI’s Climate Program.